??????? © 1989 Namco, Limited. Released on February 9, 1989 in Japan. 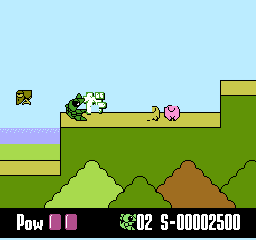 The boss theme that was later used in Wagan Land 2 and Super Wagan Land was first used in this installment for the shiritori and concentration mini-games. Sega Game Gear (1991) "Wagan Land [Model T-14047]"